First of all, I would like to thank you all for coming today, and I really hope you are enjoying the show. For this talk I thought it would have been useful to tell you how I met Roberto and how this project came about. I also thought that ideally such a description, such a "summarising exercise" could be an adequate way to set off a further discussion, a conversation, this time between you, the audience, and us, the artist and the curator. At the end of my talk, Roberto will read part of our conversation in Italian, and Rebecca Rosewarne will then intervene with the English translation of the same text. I firstly heard of Roberto's activity from some Italian art magazines, but primarily from a friend of mine, Christiana Protto, who is an artist and curator based in Frankfurt. I was already living in London then: I was searching for a conceptual frame and a feasible way to develop my personal interests in international contemporary visual culture, while maintaining my Italian background, made of thick history, maniacal respect for the ancient and the arcaic, political anarchy and adoration for books and for the written truth. 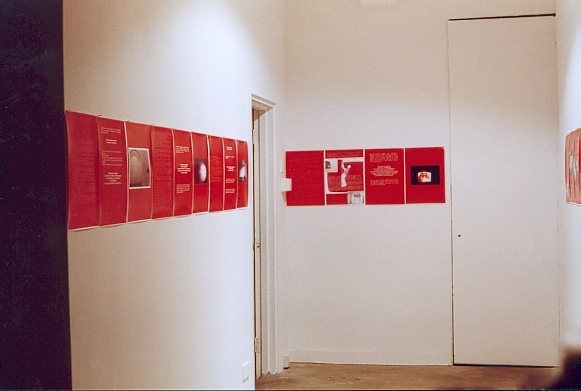 At that time, in 1999, Roberto was at the peak of his experimental trend, and had already had the chance to collaborate with foreign artists and institutions. In a way, he was also investigating how to break down the limits imposed by the white walls of his studio-gallery, Change, located in Rome, in order to possibly breathe a different air abroad. In 1999 my friend Christiana Protto had already been invited several times by Roberto to participate in group and solo shows curated by Roberto as well as by the art critic Domenico Scudero - who, for your information, has worked very closely to Roberto for the programming of Change. Christiana had also just curated the first group show for her organisation "Home Abroad" in Frankfurt, inviting artists from England, Italy and other countries in one of these now frequent European "exchanges". In that occasion Domenico Scudero and Jacopo Benci were invited from Italy. Roberto's main work-in-progress Abitare la Distanza was also presented to the German audience for the second time in one of its variants. The project itself seemed to stress the existence of a labyrinthine and volatile network whose traces, whose complex movements I then started following, observing and "witnessing" - with an typical expression used by Annecchini & Scudero. When Christiana invited me to participate in the second project of Home Abroad, called Vi'a:tiko, I had the opportunity of stepping into that network and being part of it. 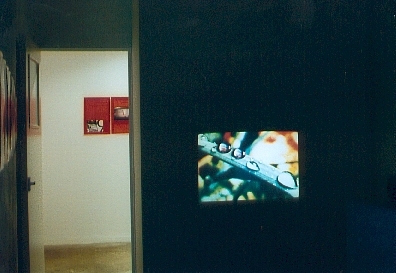 Vi'a:tiko was the development of a project that Roberto had initiated with Scudero and Mania in 1999-2000; but while the Italian version aimed at capturing the various transient ways in which art pratice meets theory and viceversa, the German version aimed at exploring the concept wrapped in the word "viatico" (viaticum in English), which intrigued the curator Christiana Protto, and was interpreted by a large number of international artists in all its potential meanings. It was in Frankfurt, during the Vi'a:tiko show, that I personally got to know Roberto, together with Domenico Scudero, Antonio Tamilia and Alberto Zanazzo. After our meeting in Frankfurt, I had in mind to interview Roberto, and to discover more about his journey, its origins and its intertwined occurrencies. However, I wasn't quite sure how to format such a popular and overconsumed genre as interviews, and I wasn't yet aware that this was a form so much pertinent to Roberto's practice's inner motivations. Interviews are a very common instrument of torture: immediately associated to police interrogations, they aim at the discovery of the "truth", no matter whether the fashionable, the cool, the sensational one. It just has to be the "truth", which today is relatively trusted and is more often enjoyed for its final multiple facets. The only way to deal with interviews, therefore, without getting stuck in double identities, faked passports and contradictory evidence, is through an abandonment to the enquirying performance, to the dynamics of the chase, and to the "distance" interviews inevitably set up and authorise between the two speakers. Because you can imagine that on one side there is a question mark, on the other side there is a full stop, and between these signs of punctuation that define two positions there is an abyss of thoughts, observations, opinions, anecdotes, life stories that then make both the speakers (ie. myself and Roberto) yet human, that is to say, subject to misunderstandings, doubts, revisions, approximations, change. 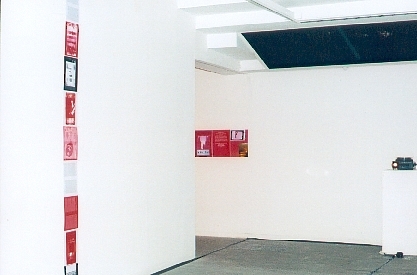 "Abitare la Distanza is, therefore, the title of a series that together with the experiments carried out in the independent space Change, clarifies and outlines the connection between two gestures: the artist's creative gesture, and the more pragmatic gesture related to the organisation and management of an exhibition space." Thus, when I started my interview with Roberto I knew (and he knew) that both of us would have listened and pointed at the space in between, trying to translate it in the common space where we were both performing. However, I would have been the enquirer and he would have been the enquired: not quite the same role, then, but with a lot to learn and share. In fact, on one side I was exercising my curiosity, my curatorial interest for "digging into practices" and my witnessing presence. On the other side, Roberto was enacting a memory exercise, a scientific analysis of his work, a rigorous replica of his daily commitment to which I'll come back later. I cannot forget his frequent use of words such as "operativo", "strutturale", etc. that so much remind me of Constructivism and the Russian avantgarde, Malevic in particular, whom in fact represents an undeniable reference for Roberto. As it went on, our interview became more and more an enacted conversation, in which text indicated visual experience and visual experience implied text. Althought firstly thought for a publication that we still hope will be realised after this event, the tortous movements of this conversation required a different space from that of a book. It was becoming suitable for staging. What was needed was a tri-dimensional field where memories of past activities, resonances of other geographies, and concepts and issues raised throught the questions could be freed from the regimental rigour of the written language and "dispersed". Dispersed, I said, though, but not wasted: which implies a fruitful diffusion in the surrounding context rather than an aborted potential. Exactly what we hope to obtain through this show/event with all of you. The aim of it, in fact, is not the total, self-sufficient and concluded experience suggested by the usual "retrospective". This is not a retrospective. Maybe it could be better called an "introspective", which is not interested in the truth of a character and an experience, but rather in the complex process through which that character, in this instance Roberto Annecchini, moves, changes, takes directions. Such a process, which is also not complete, is made of the scattered elements you will find in these installations. Here you find visual materials from the archive of Change, referring to past shows and experiences that cannot be repeated nor can happen again. Here you find fragments of text whose original in Italian might remain a mystery to most of you. Here there are also some translations which might not be fully correct, but were left as they were, not just for laziness or lack of respect towards the pureness of English language, but because we believe that gaps in the flow of the language makes us more aware of the double nature of language itself, split between form and content, between communicating a content and expressing an identity. Finally and simply, we don't pretend to be English. In fact there is something quite un-English and quite Italian in Roberto's approach, and I hope not to sound too old-fashioned in these times of globalization and of alleged citizens of the world. I must admit that what firstly struck me was Roberto's seriousness, that made me question his work and his reasons. I realised afterwards that this was because I have being living in England for too long, more than four years now, and I have become more accustomed to that cultural irony which doesn't really belong to my own country. I forgot Italian integrity, its being one and only, coherent and all-rounded. But mostly I forgot the condition of Italian contemporary art in the so-called art system, its solitude and loneliness, which only recently has been partially recovered with some regional initiatives,and thanks to the very few enlightened gallerists and collectors. This is a matter of fact: contemporary practices in Italy are not much cared for, and are left to their own devices, in a general attitude which begins in the schools and in the academies. Italian contemporary artists are burdened by a protected, respected and adored artistic legacy that certainly represents a treasure and around which all the political and economical strenghts are revolved and concentrated. Therefore, artists cannot count as abroad on infrastructures (museums of contemporary art, art centres, updated art schools) nor on consistent and rational programmes of funding. 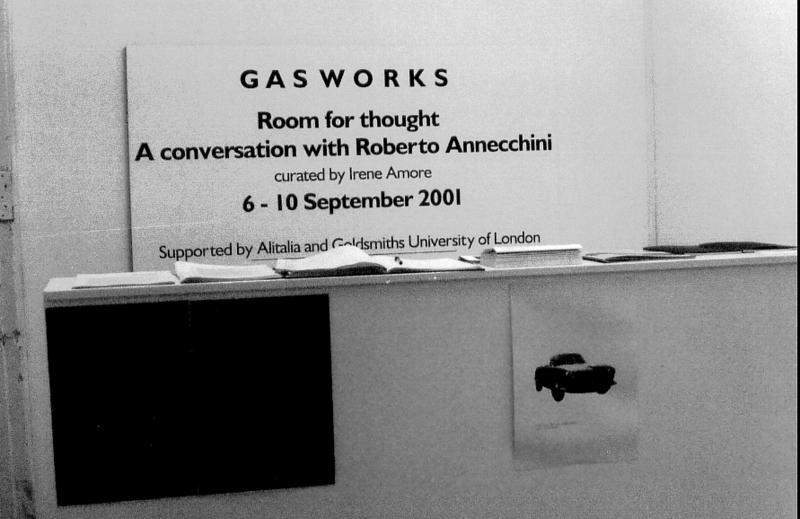 This issue, on which in Italy we all went over and over again, has been raised again by Francesco Bonami in his intervention for the catalogue of the Arte Povera exhibition at the Tate Modern this summer. It is thoroughly studied by a specialist in cultural economy, Walter Santagata, in his book "Simbolo e Merce. I Mercati dei Giovani Artisti e le Istituzioni dell'Arte Contemporanea" (Il Mulino, 1998), and reviewed by Riccardo Caldura in the volume "Espresso. Arte Oggi in Italia" which I noticed in some bookshops in London (and that seems to be the Italian response the "Cream" project by Phaidon). Now, this situation has consequences on the younger generations, and on those who are deeply interested in contemporary visual culture: simply it makes life difficult, it divulges a negative cynicism on the possibilities to "change", makes intellectual energies contrived and abstract, finally forces a seriousness as to authorise and guarantee the value of the artworks. I won't hide the fact that during our conversation Roberto's comments on the public structures available in Rome to enhance art practices weren't very positive. Whilst his work is based and enriched by the relationship with the others, and the public in general, the total absence of support for his gallery programme constantly risked making his experience not only isolated, but also invisible. As a reaction to this precarious situation, Roberto not only looked beyond the national borders, where attempts and attitudes similar to those he was exploring were to be found. He also invited artists to "take a responsibility" and therefore a stance in such a static environment, and actively decide on their own future through independent initiatives. And here we come with one of those stories of artists-led project spaces which have become almost commonplace in the English art scene, but which are still quite rare in Italy, mostly in those regions South of Florence. Change as an independent art space represents a model in the 90s in Rome, indifferent to commercial means, open to dialogue and challenging experimentation. It is already missed for its unique formula, its connections with Europe, its intense investigation of the contemporary scene, and its diverse attitude. In any case Change hasn't died yet. It has just taken a break, a short period of revision and careful consideration on "what to do next". The conversation hasn't stopped, then, there is much more to say, and more experiences to draw and write. I will now leave it to Roberto, with - as I said before - a reading in Italian from our conversation, followed by Rebecca Rosewarne reading of the translation of the same text in English. I hope you will enjoy not only the content of the text but also the sound of it, which is to say the sound of a diverse language. After that, it will be your turn, so please feel free to ask questions and suggests comments: we would like to feel, as Roland Barthes used to call it, "the grain of your voice".